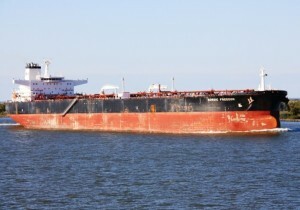 The crude carrier Nordic Freedom was attacked by pirates in Gulf of Guinea on 80 nautical miles off Brass, Nigeria. The vessel was adrift under ballast in Agbami field area, waiting for loading at Agbami offshore oil field. The Suezmax crude carrier was enclosed by a boat with 7 armed pirates in early morning. The high freeboard and fast reaction of the crude carrier’s crew prevented boarding of the vessel by the pirates. The ship proceeded to the Agbami FPSO, which was under security of local navy. The pirates abandoned the attack and fled away after the unsuccessful attempt. 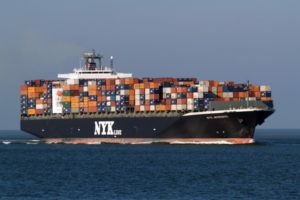 The crew of the Suezmax crude carrier Nordic Freedom reported about the piracy attack, but the navy failed to follow the traces of the fast boats of the pirates, which proceeded to north direction. During the accident there were no injured people and crude carrier successfully moored FPSO for loading during the same day. The Suezmax crude carrier Nordic Freedom (IMO: 9288887) has overall length of 274.00 m, moulded beam of 48.00 m and maximum draft of 11.00 m. The deadweight of the ship is 159,331 DWt and the gross tonnage is 83,594 GRT. The oil tanker was built in 2005 by Daewoo Shipbuilding and Marine Engineering in the shipyard in Geoje, South Korea. The ship is managed by Norwegian shipping operator V.Ships.